Chattanooga (which was purchased by DJO Global) offers a clinical grade cold laser called the Vectra Genisys. This class 3b laser system includes a separate controller and emitter that allows users to build a semi-custom system. The laser modality can also be integrated into a more complete single controller system using special modules. The EMG system uses lead wires allow for measurement of electrical impulses in the muscles. 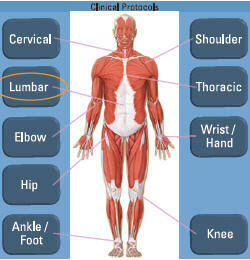 This information can be used to for patient diagnostics. System with ultrasound are available in 2 or 4 channel systems. The ultrasound applicator requires the use of a gel. Please call us for a quote on a combination system that includes EMG or ultrasound. We offer 2 standard options for base control units The laser-only system includes a monochrome display of pulsing frequency and output. The Laser/Electrotherapy system has a full color display that with an internal library. This system can be used for eith er laser or electrical stimulation but does not do both at the same time. The electrotherapy/laser controller operates using 2 channels when in the electrical stimulation mode. The electrical stimulation on this system is up to 100 times more powerful than similar systems like the TerraQuant LaserStim and MR4 LaserStim. Please call us to if you interested in adding EMG to a system. Chattnooga Vectra laser emitters are not compatable with the Intelect or NEO series of controllers, only the Genisys series! Every Chattanooga Vectra Genisys system requires a CONTROLLER and at least one laser EMITTER (listed below). All systems include the laser-therapy protocol library for supplementing the factory manuals and protocols. (2784) Monochrome display. Emitters NOT included, sold below. (2872) Color display. Includes your choice of ultrasound emitters*, lead wires, pack of 10 pads and laser adapter. No EMG. No Cart. No remote, No battery. Laser Emitters NOT included, chose from the options below. (2874) Color display. Includes your choice of ultrasound emitters*, lead wires, pack of 10 pads and laser adapter. No EMG. No Cart. No remote, No battery. Laser Emitters NOT included, chose from the options below. *Includes your choice of 1,3,5 or 10 cm2 ultrasound emitter. Chattanooga probes use Infrared lasers and red LEDs and SLDs to penetrate tissue for increased blood flow and allow for more rapid healing. Because of its superior ability to stimulate rehabilitation versus other laser therapies, Chattanooga Group's system is preferred by many clinicians. Use the single laser diode probes for trigger point therapy, laser-accupuncture and for treating smaller areas. Use the cluster probes for treating larger areas. Higher power probes will have shorter treatment times or you can go to higher dosages. The number one recommended emitters for general structural therapies are the 9 diode 1040mW cluster probe and the 33 diode cluster probe. The 300mW single diode probe is recommended for trigger point and laser puncture therapy. 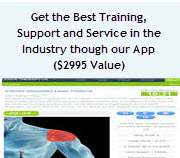 Price includes delivery and training. The follow accessories can add more flexibility to your Chattanooga system. 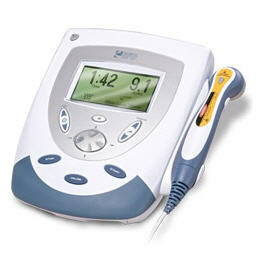 The Chattanooga Group also offers EMG and ultrasound unit with a similar design. This system is made in the USA. Chattanooga Group is the world's largest manufacturer of rehabilitation equipment for treating muscular, skeletal, neurological and soft tissue disorders. With over 5000 employees and over 1000 products, they have a huge presence in the rehabilitation market.